EVERYTHING YOU NEED FOR CREATING ROOM DATA. eRDS Cloud creates comprehensive room data in a well thought out user environment designed by room data professionals with decades of experience in the discipline. 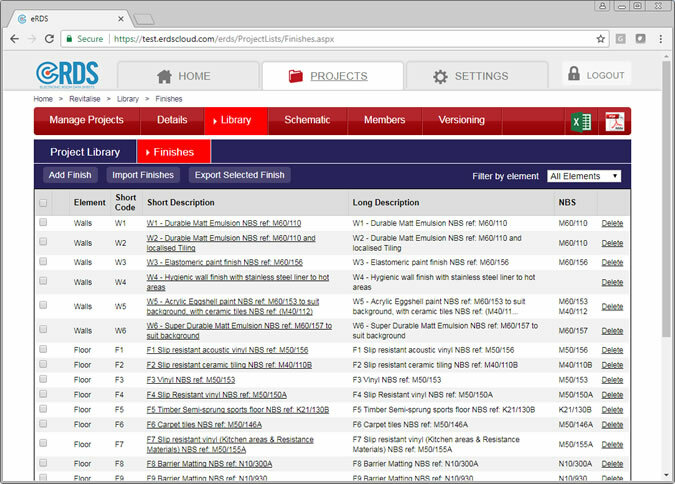 The project library is for setting up the various elements, finishes, components, short-codes, groups, classifications, specifications, and suppliers that will be used in your building. You can import libraries from other projects, create one at the start of a project, or add to the library as you go forward. The library ensures consistency and increases productivity by ensuring you enter repetitive data just once. And when changes occur, as they surely will, you can edit the information in one place, and auto-update all the rooms where the information has been applied. A list of rooms is created in the eRDS database using information extracted from your Revit or IFC model. You can search for rooms by their names or numbers, or filter room types, for easy analysis and editing. To see what’s inside a room, simply click from the list of room numbers. to open the room details tab. The last modified dates and status will ensure you are working with the latest version of the information. 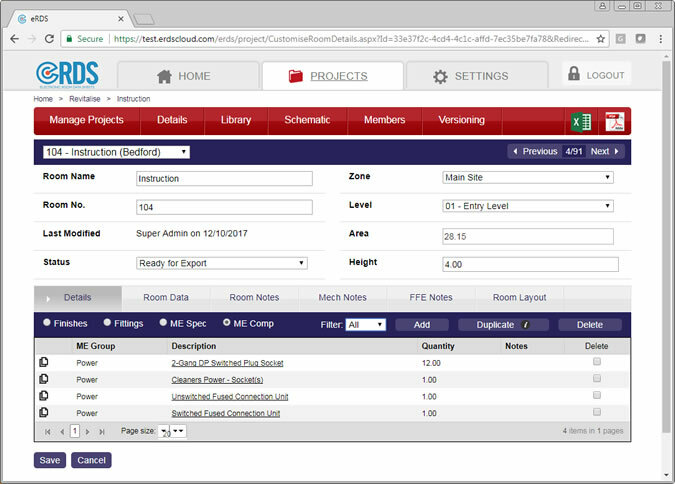 When you navigate to a specific room, eRDS will display all of its properties in a simple and intuitive way. There are four sets of key informaton; Finishes, Fittings, ME Spec and ME Components. Just click through the tabs to find the information you are looking for. You can quickly review the design notes for the current room, or open the descriptions to see more information. Quantities of fittings and components are listed, including details about manufacturers, suppliers, and even cost. 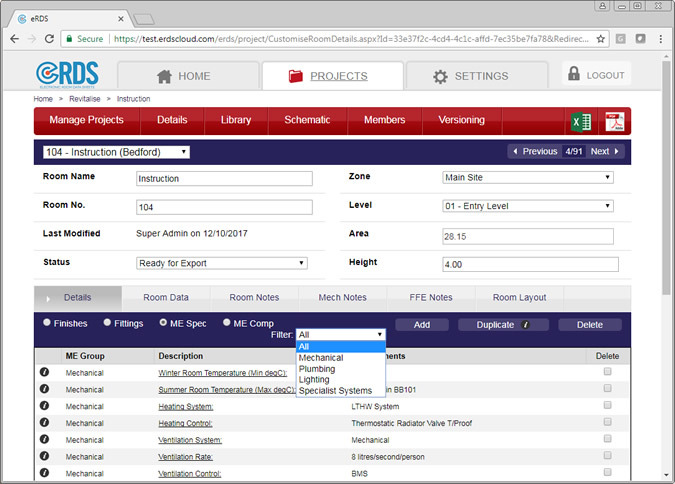 The fittings tab lets you add, view, edit or print a complete list of furniture and fittings that will be installed in the room. You can filter by fitting class and use the quantities for cost calculations. Clicking on any of the items will show more detailed information and any documents that are associated with it. Design notes are added to clearly specify the intent and to assist the fit-out team. There is a detailed page of information showing the environmental design conditions for each room. Lighting, data, security and specialist systems information is all easily viewable in one place. This is where the method of heating and cooling, and any provision for hot and cold water is defined. You can apply filters to see just the discipline of interest to make comparisons as you scroll through different rooms. And off course you can create ME Spec reports for the whole building either in excel or as pdf. 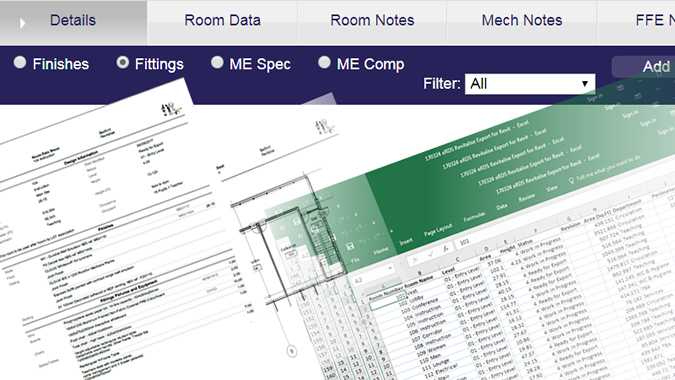 The ME Comp section allows you to specify the type and number of power, data, lighting, plumbing, and specialist components in each room. Mechanical components include electrical sockets, fused spurs, lights & PIR, wall switches & controllers, data & TV sockets, sinks, radiators, cookers & hobs and white goods. In fact everything that will be fitted into the room. All or part of the information can be exported to excel for cost analysis. And when its imported into Revit, you will enrich the model with a level of detail that’s rarely, if ever, found in BIM. Quickly create reports as PDF or excel files. 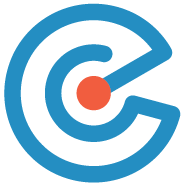 Our easy to use filters provide a hassle-free method for producing exactly the kind of report you need, and you can even add your company logo. Your reports can specify individual rooms, ‘types’ of room, or all rooms in your building. You can also specify a full RDS report, or choose selected parts from the database. When exported to excel the information can be used for other work-flows such as cost calculations. And If you wish to include the data in a COBie file, then our Revit App will do the job for you. 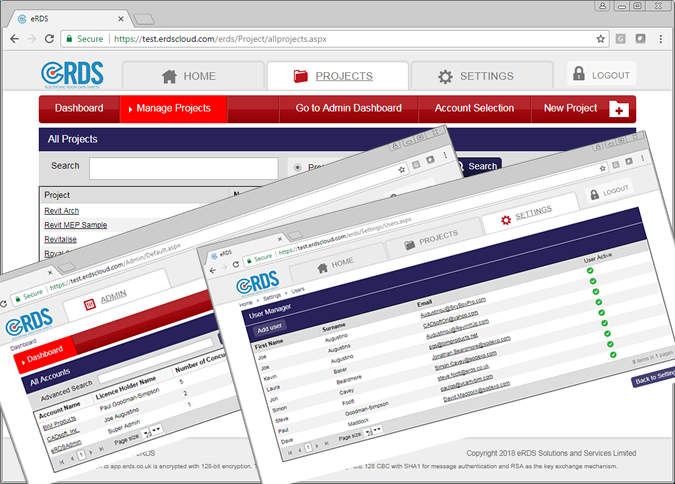 eRDS Cloud is a multi-user solution capable of handling multiple projects of any size and includes tools to manage all aspects of your projects. 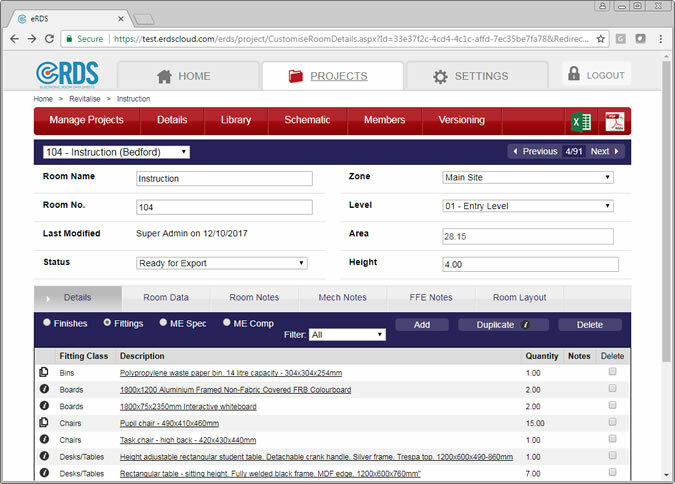 Adding users is quick and easy to do allowing you to open the information to other project stakeholders as and when they need it. 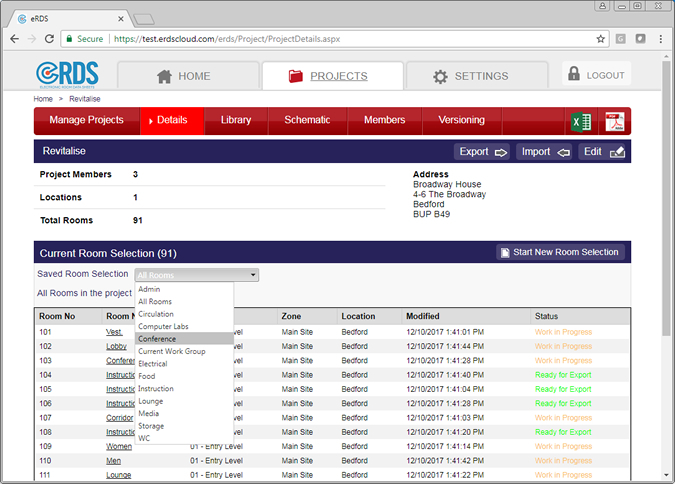 You can specify which projects users can work on, and set their credentials to be read-only or full access. Discipline controls within the projects means you can hide certain aspects from some users, or ensure subcontractors see just what you wish them to. Versioning control is included so you can keep track of changes and re-instate earlier versions if you need to make comparisons or find out what was happening on a particular date. 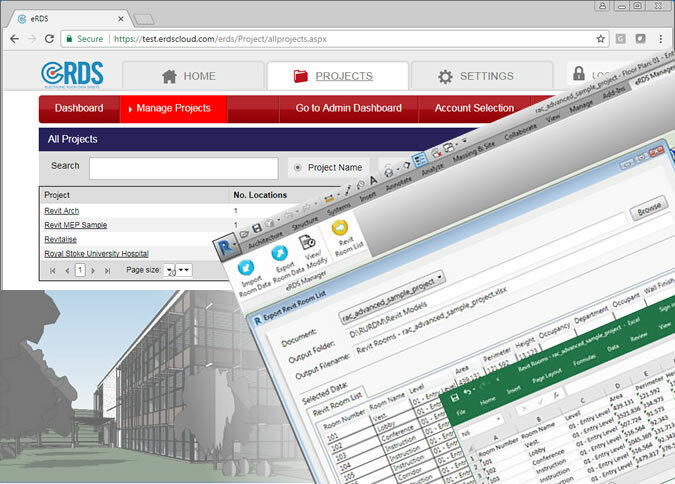 Advanced data exporting tools allow entire projects to be transferred between architect, main contractors and building owners to ensure the information stays with the building through its lifecycle. Setting up an eRDS Cloud project is simple thanks to tight integration with Revit and IFC models. Our BIM plugins extract the necessary information from the models into an excel file which is used to create and set up a new project with the corresponding room and floors. In cases where there’s an MEP model, our software helps designers to quickly identify the maintainable assets into an excel file which is imported into eRDS where the assets are assigned to the relevant rooms. To further increase efficiency, Library information from previous projects can be loaded into the current project and assigned to the rooms. 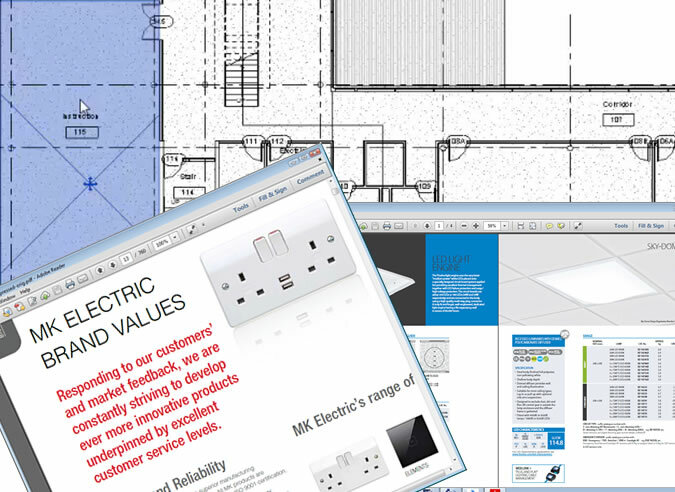 Room layout drawings, 3D visualisation images and supplier documentation can be uploaded to eRDS Cloud. This provides a better understanding of the building and the fittings and components that will be installed in each room. 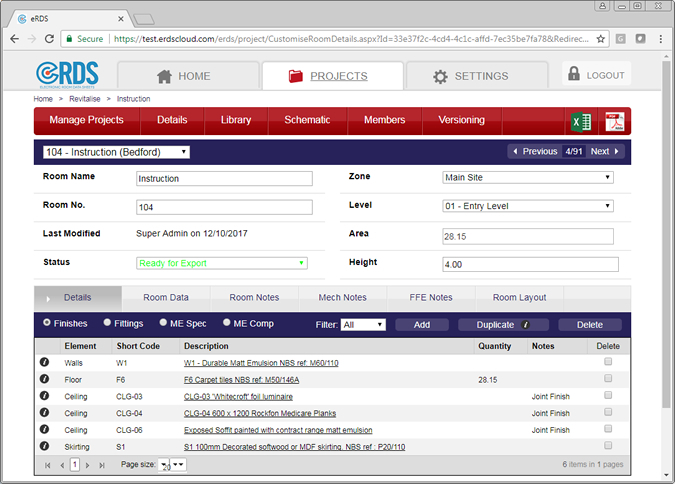 Such information is invaluable during the fit-out process as it helps ensure the correct specifications are being met, and during facilities management it provides operatives with quick access to the detailed information needed to solve issues.